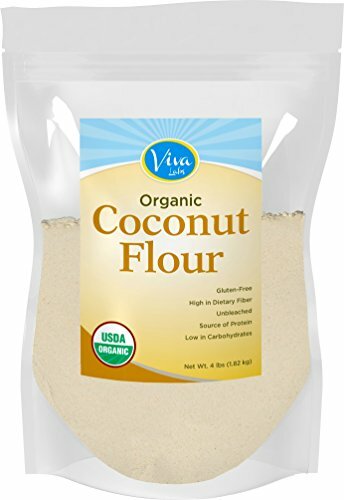 Organic Non-GMO and Gluten-Free Coconut Flour - 4 Pound by Viva Labs.. Exceptional Nutrient-Dense Profile - unrefined coconut flour is an excellent source of fiber, iron and health-promoting medium-chain triglycerides (MCTs). MCTs provide a source of rapidly-utilized energy and have been shown to assist with healthy weight management. Naturally Grain-Free - those following a gluten-free, Paleolithic, low-carb, raw food diet or simply health conscious individuals, love using our delicious coconut flour in everyday recipes to boost the nutritive value of traditional cuisine. Exceptional Flavor, Taste and Aroma- use coconut flour to make delicious breads, cookies and muffins without the "after-guilt" commonly experienced with refined baked goods. White Flour Alternative - substitute 1 cup of wheat flour for ⅓ cup of coconut flour while doubling the amount of eggs and adjusting liquid to personal preference. Try making delectable Paleo pancakes for a nutritious high-protein and high-fiber breakfast. Viva Labs 100% pure, unbleached, non-deodorized coconut flour is free from unwanted additives and fillers..